NOTES: Used FAA Models Gannet sets FAAM001, FAAM002, FAAM003; Eduard SS290 Gannet Interior; Xtradecal 72-070. Some original Trumpeter kit remains. For the Fleet Air Arm, the near-defeat of the Allied forces in the Battle of the Atlantic had taught the lesson that there was a need for a carrier-based anti-submarine aircraft that could be seen as a conceptual modernization of the Grumman Avenger, i.e., an aircraft large enough to carry the gear necessary to detect a submarine, the ordnance necessary to destroy the target, and the fuel to provide the range, with enough speed to hit he target before it could submerge. Fairey Aviation, as one of the main providers of aircraft to the FAA, was already thinking of what could be called an “Avenger replacement,” particularly since it was known that the rules of Lend-Lease were such that the FAA would have to get rid of its fleet of Avengers as rapidly as possible following the end of the war, thus creating an equipment gap that could be usefully filled by a domestic design. Several proposals were put forward, including one to create a twin-engined version of the Firefly, in which the second engine would be buried in the fuselage behind the pilot, with each engine driving one set of blades of a contra-rotating propeller. The Admiralty issued GR.17/45 in late 1945. Looking at the specifications the design staff at Fairey decided one of their other projects - originally an observation aircraft with twin Merlins - could be developed into a suitable airframe for carrying the new electronic equipment now available and could be modified to use turboprops rather than reciprocating engines. While Fairey worked on what was now called the “Type Q,” Blackburn submitted the YB.1 design (also known as the B.54/B.88). With typically-British bureaucratic decisiveness, approval was given in August 1946 for two prototypes to be built - one from Blackburn and one from Fairey. For a power plant, Fairey settled early on the Armstrong-Siddeley Mamba turboprop, coupled with two independent power sections driving separate propellers and known as the Double Mamba and later known as the Twin Mamba. While both sections were used for take-off, one could then be shut down in flight, extending range and patrol time. The engine used diesel fuel, which meant the airplane could use its aircraft carriers' diesel fuel bunker and thus eliminating special aviation gas tanks aboard ship, which greatly improved safety and vulnerability in combat. Originally the design included a two man crew, with the pilot seated well forward and given a good view over the nose for carrier operations, and an aerial observer seated under a separate canopy directly behind the pilot. After initial flight tests, a second observer position was added, with a cockpit over the wing trailing edge. This created a disturbed airflow over the horizontal stabilizer. Small finlets were placed outboard on the stabilizers to on either side to correct this. A large internal weapons bay was included, with a retractable radome immediately aft of the bomb bay. The constricted size of hangar decks on British carriers necessitated a radical wing fold system to allow the airplane to be struck below decks and carried aboard in sufficient numbers. The result was a distinctive Z-shape for each wing. A tricycle landing gear was used to make landings and takeoffs easier. The prototype, known named “Gannet” after the large sea bird found in the North Atlantic, first flew on September 19, 1949 and made the first deck landing by a turboprop aircraft on an aircraft carrier on June 19, 1959, when LCDR Callingham landed aboard HMS Illustrious. The Gannet entered production in 1953 with an order for 100 as the Gannet AS Mk.1. The first aircraft were delivered to 826 Squadron at RNAS Ford in April 1954, and after work-up, the squadron embarked on HMS Eagle. In august 1954, the T. Mk.2 trainer first flew, followed by 35 trainers. In 1956, the first of 255 up-rated Gannet AS Mk.4 arrived in the FAA, which allowed for complete replacement of the aging Fireflies and Avengers. The first prototype of the Gannet AEW Mk3 flew in 1958, filling the need for an airborne early warning aircraft to replace the Douglas Skyraider AEW Mk.1. The Mk.3 involved a major re-design that included a new fuselage and longer undercarriage to allow for a radome. 44 AEW 3 Gannets used the American radar that had equipped the Skyraiders; following the retirement of these aircraft, their radars continued in use by the AEW Shackletons. By the middle of 1960, the AS.1 and AS.4 Gannets were replaced by the Westland Whirlwind in FAA frontline ASW service. A few AS.4s were modified as the ECM.6 with major modifications and additions to the electronics suite. These aircraft were only shore-based. The COD.4 was modified from the AS.4 as a basic transport after most internal equipment to create space for extra seats or cargo. The Royal Australian Navy purchased 36 Gannet AS.1 aircraft, which operated from the aircraft carrier HMAS Melbourne and the shore base HMAS Albatross near Nowra, New South Wales, and were used until 1968. The German Navy bought 40 AS.4 and eight T.5s rebuilt from T.2s, which were operated until the early 1970s. Indonesia bought a number of AS.4s and T.5s that were rebuilt AS.1s and T.2s in 1959. Several Gannets have survived in museums, including two airworthy Gannets operated in the United States. 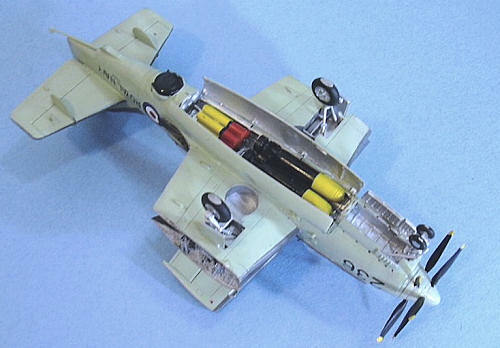 The first 1/72 plastic kit of the Fairey Gannet was a very basic release from Frog which I first saw at the old Bonnie Brae Hobbies in around 1959 if I recall correctly. This was a very basic kit with the crew represented by heads molded into the cockpits. Having already fallen in love with Odd Brit Aeroplanes after finding William Green’s and Gordon Swanborough’s “All The World’s Aircraft 1954" in the local library, I really liked these Frog kits that gave me the ability to make models of those strange airplanes, including at least a couple Gannets. This kit was later updated somewhat, and was the basic Gannet kit for the next 30-odd years. In the 1990s, Dynavector released a very good 1/48 vacuform Gannet, and last year Classic Airframes released a limited-run injection-molded 1/48 Gannet that is quite nice. This 1/72 kit from Trumpeter, released last fall, is the first new kit of the Gannet from a major manufacturer since the Frog offering. As of this month, there is now a second 1/72 kit from Revell available. Trumpeter’s kit provides 99 parts and a decal sheet with three aircraft, one West German Navy and two Fleet Air Arm. The flaps are separate and can be posed open. 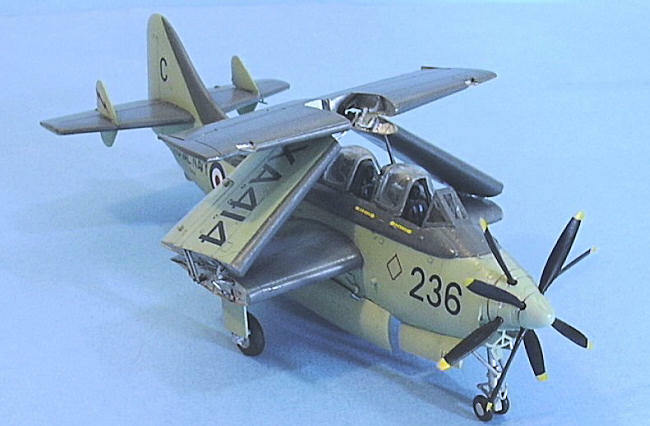 Several aftermarket items have been produced for this kit, including three very good resin sets from FAA Models that allow a modeler to create a Gannet with the bomb bay open and filled with ordnance, and folded wings, which can be obtained from A2ZeeModels (http://www.a2zeemodels.co.uk). These resin parts are well designed and crisply molded. Xtradecal 72-070 provides very good decals for six different airplanes. Eduard has released two different photo-etch cockpits, one for the AS.1 and one for the AS.4 that provides pre-painted detail much better than most modelers can create in this small scale. I decided to use everything in my project. Construction began with the fuselage, as I cut off the molded-in bomb bay doors and then dremeled that area smooth so that I could put the resin bomb bay in position. Once the bomb bay was removed from its molding block and cleaned up, it fit perfectly. I attached the radome in the fully-retracted position. I painted the kit cockpit parts in Tamiya “NATO Black” with the seats painted “Hull Red” to simulate the Bakelite they were made from. I attached the Eduard photo-etch parts as I assembled each cockpit, and then glued them in position in the fuselage half. I cut off the floor in the pilot’s cockpit forward of the instrument panel to provide as much space as possible for what I knew was going to be a maximum amount of weight to insure nose-sitting. I used small fishweights, which I squeezed as thin as possible with pliers, and then stuffed them into every nook and cranny in the nose. When I glued the fuselage together, it was clear there was sufficient weight in there. The kit wings are discarded for the resin parts provided for folding the wings. There are three main parts for each wing, with small detail parts for the wingfold areas. I attached the inner wings, and then the horizontal stabilizers and finlets. At this point, the model was ready for paint. The wheel wells, bomb bay, landing gear, interiors of gear doors and bomb bay doors, and the interior areas of the folded wings, are painted aluminum. I used Tamiya Flat Aluminum for this. The exterior was painted with Xtracrylix “Extra Dark Sea Grey” and “Sky.” When all was dry, I gave the model a coat of Xtracrylix Gloss varnish. I used Xtradecal 72-070 to do the Gannet AS.Mk.4, XA414, of 810 Squadron aboard HMS Centaur in 1960. These are excellent decals and went on without difficulty. When all was set, I washed the model and dried it, then applied a coat of Xtracrylix Satin varnish. I attached the landing gear, put the torpedoes and flares into the bomb bay, and glued the bomb bay doors in the open position. The kit-supplied canopies can be posed in the open position, which I did so the Eduard detail could be seen. The folded wings are not as hard as they appear, though they are certainly not easy and do require considerable attention. The big thing to be careful in doing is to get the middle wing section in the correct position when attaching it to the inner wing. I studied several photos to get the position and angle of the fold; in the end it turned out I had missed getting the accurate attachment point by about 1/32 inch or less, when I was unable to attach the wing braces without them bowing. At that point, I was unwilling to break what had been fully assembled and to start over. The braces are on the wing when the airplane is parked and there are photos of it without the braces, so that is how this ended up. After assembling the inner and central wing sections with cyanoacrylate glue, I attached the detail parts as best I could after again studying the detail photos. 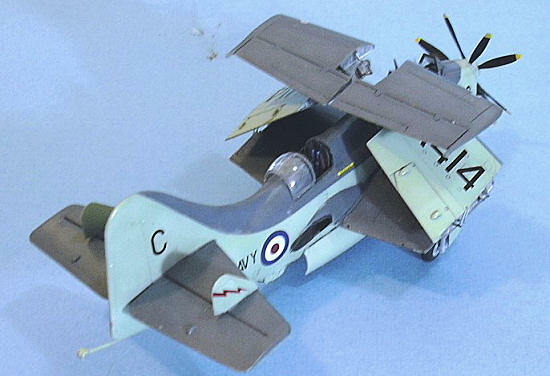 For me, I doubt this model will ever been seen by anyone who is any sort of expert on the Gannet wingfold. In other words, “close enough.” The detail parts for the attachment of the outer section were glued to that part and the central part, and then the outer wings were carefully placed in position and made solid with cyanoacrylate. The ultimate result is pretty strong, but also quite brittle, so it needs care in handling. The Gannet is an odd-looking airplane to begin with, and even odder with its wings folded, which makes it a perfect choice for display at Le Chateau du Chat. 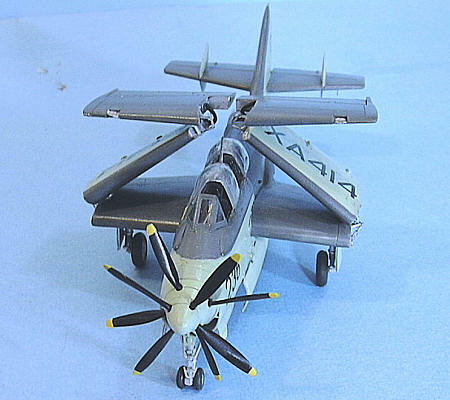 I believe all the parts used in this review can also be used with the new Revell Gannet. It’s definitely not a weekender, but it’s also definitely a model that will get a universal second look when completed. Thanks to Stevens International for the review kit. Thanks to A2Zee Models, Eduard and Hannant’s for the aftermarket sets.